As the sun went down on a gorgeous, windy afternoon in Las Vegas, Carl Edwards did a backflip to the delight of the crowd. With his second straight victory in as many races - a win that will stand despite failing post-race inspection - he's made his case for Ford's resurgent operation. And with that, I'll do a little gymnastic move of my own -- cartwheeling away from a prediction that's all but torn to pieces. Just a week and a half ago, on "SI.com,": http://sportsillustrated.cnn.com/2008/writers/tom_bowles/02/20/ford/index.html I profiled the struggles of the Fusions after Daytona. With a best finish of 10th, some questions on horsepower, and two teammates taking each other out, it hadn't been the best of Speedweeks for the Ford faithful; and with Roush Fenway's poor showing with the CoT compared to other mega-teams in 2007, it seemed this would be the year the Blue Ovals fell off the charts. 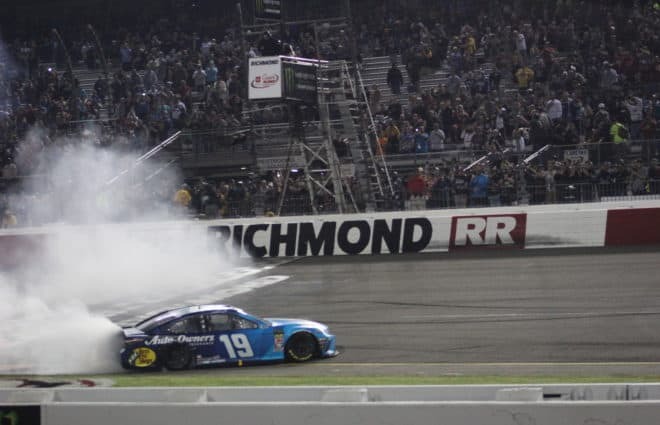 *The Key Moment:* On lap 237, Carl Edwards powered around Matt Kenseth to take the lead for the final time, eventually scoring his second consecutive win. *In a Nutshell:* Oh well, at least it didn't rain. *Dramatic Moment:* When Jeff Gordon got into the rear quarter panel of Matt Kenseth's car at the front of the pack with four to go a field decimating wreck was narrowly averted. 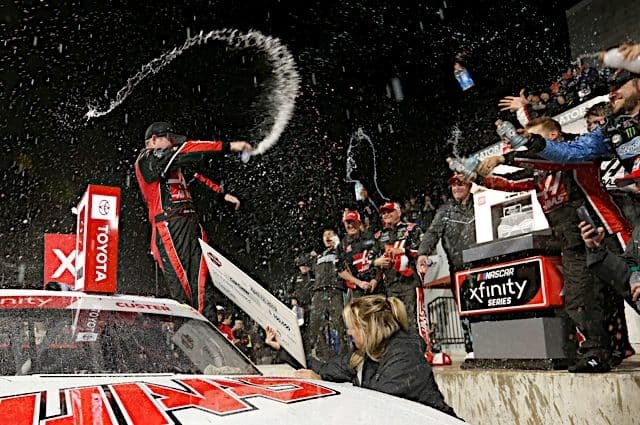 *What They'll Be Talking About Around the Water Cooler This Week* *Carl Edwards wins two in a row three races into the season? * If nothing else, it proves the futility of pundits making pre-season predictions. Right front tires and unstable grip were the talk of the town Sunday at Las Vegas Motor Speedway, variables which led to increasing instability as the Top 35 standings continue to fluctuate early in 2008. The mix of a new track configuration, a new car, and wind gusts up to 40 mph all led to an unpredictable race Sunday. But the mystery reached a whole new level when Goodyears started popping like popcorn -- right front tires blowing out and questionable tire grip accounted for the elimination of several drivers. Among the '07-'08 bubble drivers involved in these tire-related woes were Patrick Carpentier, Robby Gordon, Kurt Busch, and Sam Hornish, Jr. For Carpentier, the blow was especially devastating; the rookie made his first Cup race of the year, and desperately needed points to dig his No. 10 team out of a deep hole to being 2008. 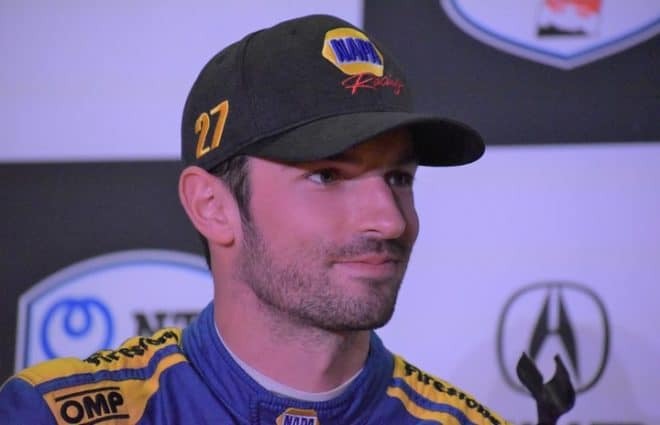 *Rookies in the Starting Lineup:* Patrick Carpentier (12th), Sam Hornish Jr. (20th), Regan Smith (28th), Dario Franchitti (42nd) *Unofficial Finishing Positions:* Dario Franchitti (33rd), Regan Smith (34th), Patrick Carpentier (40th), Sam Hornish Jr. (41st), *Rookie of the Race: Nobody. 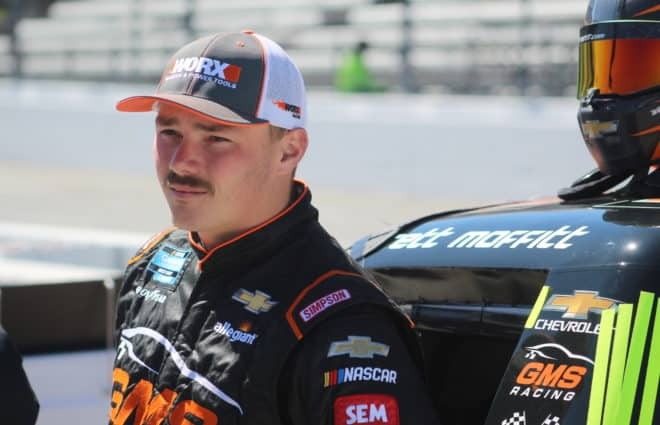 * I have decided that I am not going to award the "Rookie of the Race" to any driver unless one of them cracks the Top 30; so, for the second week in a row, I will not acknowledge any freshman for this category. 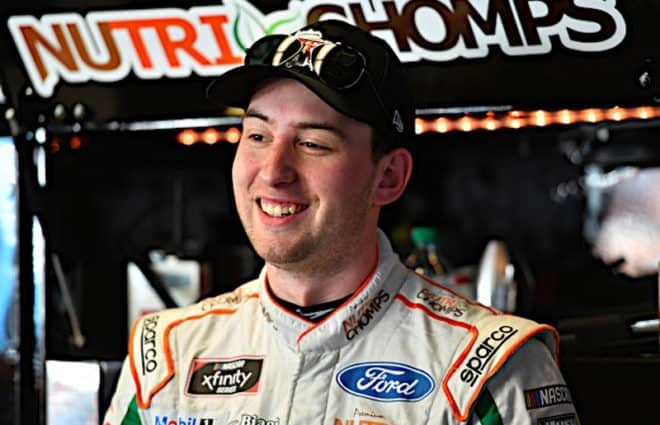 While Sam Hornish, Jr. showcased early potential, he was once again the victim of bad luck early in the race, as he cut a tire on the tri-oval around the lap 50 mark. He would wreck and finish in 41st -- only two spots higher than his last place performance a week ago. With Hornish forced to the sidelines, it was actually Patrick Carpentier who was having the most successful weekend in Las Vegas. To the Emergency Workers and Officials at California Speedway: I don't envy your jobs. You (and hundreds like you at tracks big and small, across the country and back) work in anonymity, but you have an awesome responsibility placed on your shoulders. You don't know, when you get to that next car, what you are going to find, and you go anyway. Many times emergency crews are criticized for their slow response time to an on-track incident. On Sunday, in a business where seconds count, too slow can be the space of one heartbeat, but you didn't wait even that long. It's fairly easy and sometimes fun to fire both literary barrels at the governing body of NASCAR. Heaven knows they make easy targets of themselves. The brass makes weighty decisions that are often detrimental to the sport (although they are never penalized for it under 12-4-Q or whatever), and their "innovations" don't often endear them to fans. I've been known to say more than once that I'd be willing to pay more for a race ticket to send Brian France on a permanent vacation to Bermuda or somewhere. Still, a columnist doesn't want to keep grinding out the same stuff all of the time. It's negative, for one thing, and Tom Bowles has asked us all to try to be more upbeat about the sport occasionally. He has a point. Certainly so in my case. But the events of last Sunday and Monday even got his goat, and I thought that, downbeat as this column may be, it's sort of a look at things to come. Sometimes, it's difficult to find something positive to say. Besides, it was news. Round three of the Cup series will take place in the desert West as the circuit heads to Las Vegas for the UAW-Dodge 400. The reconfigured Las Vegas Motor Speedway is set to offer up some very intense racing with its variable banking. As the teams continue to figure out this new car configuration, the passing on the track becomes more and more prevalent. Hopefully fans are appreciating the fact that cars are actually making passes for the lead on the track this year. To see which drivers our experts think will make the passes that count and end up in the front or rear this weekend, read on in this weeks Picks â€˜n' Pans. *Matt, I have been watching NASCAR for close to 20 years and I am speechless over the events that happened on Sunday at Californiaâ€¦ oh, I'm sorry, Auto Club Speedway. Having been watching for what feels like a long time, I don't ever remember NASCAR handling a weather problem with as much ineptitude as I witnessed at the Auto Club 500. * *Not only are California races boring to watch (don't get me started on the Labor Day date!) but having to watch all day and all night (because I'm a fan of the sport and I'll watch them race in quicksand if that is the case) just to see nothing but two crashes that should have and could have been avoided was just a senseless way to spend a Sunday. Could this whole ordeal have been avoided, or is this a problem that happens when the conditions are right? * *Thanks for letting me be heard, Matt! I really enjoy your column. * _â€” Mary A. Dunne_ *A:* Thanks for using this column as it was intended, Mary. I believe you've expressed what many confused and frustrated fans were thinking. And yes, I do believe that circus could have been avoided. How The Rankings Are Calculated: Frontstretch does their power rankings somewhat similar to how the Associated Press does them for basketball or football -- writers on our staff will vote for the Top 20 on a 20-19-18-17-16-15...3-2-1 basis, giving 20 points to their first place driver, 19 for their second, and so on. In the end, Mike Neff calculates the points, adds some funny one liners, and ... voila! You have the power rankings from our dedicated staff. So, without further ado ... here's our latest Power Rankings following Fontana.